Regardless of some macroeconomic advantages in comparison with other emerging countries, Russia is hardly likely to avoid the consequences of the global financial downturn. All global financial shocks since 1990 have chiefly been expressed by the outflow of capital from developing countries, irrespective of whether these shocks were caused by developing countries themselves (like the 1997 global shock caused by the East Asian currency and debt crisis or the 1998 global shock following the same crisis in Russia) or by events having no connection to these countries (as in all other cases). This tendency is natural, given that investors, eyeing high returns, give their money to funds for investment in securities markets of developing countries. Investors, however, understand from the very beginning that these investments are riskier, compared to investments in securities markets of industrial countries. Since financial shocks are chiefly expressed in increased instability of all securities quotations worldwide, alarmed investors get rid of securities of developing countries first. 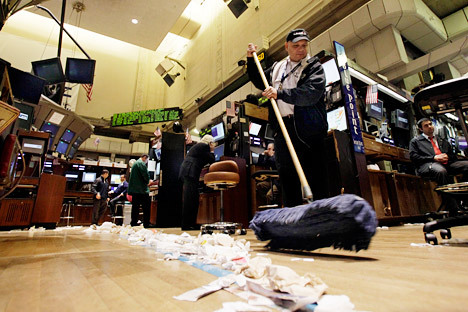 Examples of such behavior are numerous: the 1998 financial shock caused by Russia’s currency and debt crisis, the financial shock caused by the 2001 terrorist attack on the US and the 2008 global financial crisis that followed the bankruptcy of Lehman Brothers Investment Bank. In each instance, investment funds significantly cut investments in developing countries in a process that spanned several months. In addition, financial shocks are accompanied by an increased cost of borrowing for developing countries: they automatically become shakier borrowers for foreign creditors than, for instance, the United States. A month after the financial shock that was caused by Russia’s currency and debt crisis, the cost of external borrowing for developing countries increased eight times; two months after the shock caused by the Lehman Brothers’ collapse, it grew four times. It is clear that a country is affected by global financial shocks only if it is integrated into the global financial market. The ratio of external assets and external liabilities (i.e. debts from and to foreigners) to GDP can be considered an indicator of integration. Since 1990s, global, financial integration of emerging markets has significantly increased. The mean value of this parameter for emerging markets in Eastern Europe, including Russia, was 180 percent in 1995 and, by 2010, 500 percent. For emerging markets in Asia, it has increased from 150 percent to 350 percent; in Latin America markets, it has rose from 50 percent to 150 percent. In terms of the level of integration into global financial markets, Russia was ahead of many emerging markets by the year 2010. This means, however, that each subsequent, global, financial shock should affect the country significantly. What to do in an unstable economic climate? Shop! At the same time, the level of impact that global financial shocks have on emerging markets depends considerably on macroeconomic parameters. It is obvious that the worse a country fares in terms of such parameters (such as the ratios of current balance of payments deficit, national and external debts, and budget deficit to GDP), the quicker and more disappointed investors and speculators become during the crisis. In 2000–2010, such countries as Jamaica, Turkey and Jordan demonstrated an increase in the ratio of current balance of payments deficit to GDP; the ratio of national debt to GDP rose in Singapore, Uruguay, South Korea, Malaysia and Hungary; the ratio of external debt to GDP grew in Hong Kong, Singapore, Estonia, Latvia, Hungary, Lithuania, Poland and Romania, while the ratio of national budget deficit to GDP increased in Ukraine, Lithuania, Slovenia, Poland and Romania. During this time period, Russia demonstrated a surplus, not a deficit, in current balance of payments: its ratio to GDP did not change during ten years, and, in terms of this parameter, only Singapore and Malaysia were ahead of Russia. Thus, from this viewpoint, Russia, in principle, was and is more resistant to shocks than most other countries. Russia’s ratio of national debt to GDP dropped significantly in 2000–2010; it can currently be considered a leader amongst developing countries, in this respect, and is least likely to provoke investors’ fears if a crisis occurs. Russia’s external debt-to-GDP ratio has also dropped considerably and remains at a very low level. The same can only be said for Brazil, Peru and Thailand. What evokes concern is Russia's budget. In terms of the surplus-to-GDP ratio, only Singapore and Jamaica were ahead of Russia in 2000, and, by 2010, the surplus was replaced by a deficit. The same change took place in South Africa, Ecuador, Venezuela and Bulgaria. In terms of the budget deficit-to-GDP ratio, although Russia was behind such countries as India, Ukraine, Slovakia, Latvia, Lithuania and Poland by 2012, global financial markets held a negative impression of the country due to its rapid slide from surplus to deficit. The impact of financial shocks on emerging markets is shown by effects on these countries’ GDP: economic growth turns out to be smaller than it could have been or turns into a full-scale recession. According to the estimates of IMF experts, Russia suffered the most, having lost 2 percent of its GDP in total, following the financial shocks that hit between 1990 and 2008. During the recent shock that broke out in September 2008, Russia appeared to be among the leaders again, suffering significantly greater losses at 12 percent of GDP, while Turkey lost 9 percent of its GDP, Thailand and Brazil lost 8 percent of GDP each, and India lost nothing. It is noteworthy that, after the following global financial shock, when players of the global securities market were panic-stricken by the debt crisis in Greece on May 5, 2010, Russia lost nothing. This can obviously be explained by global oil prices, which did not drop in 2010, as they fell incredibly in 2008. Comparing Russia to other emerging markets during this period of shock, everyone completely understands that the level of financial integration and macroeconomic parameters are not the only things that matter here; but that fact that Russia, unlike its rivals, is the largest oil producer in the world plays a part, as well. First published in Russian in Kommersant-Vlast magazine.